A fun little improvisational jam from the weekend using the Monologue and Volca Bass Keys and Sample. I have a lot of fondness for the Korg Volca line. They sound great. 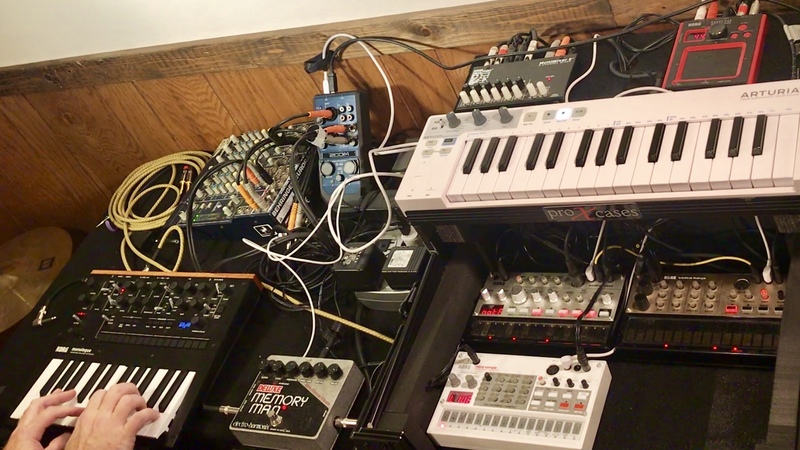 Yes Volcas are limited (what can you expect at that price point), but its gear that enhances productivity with limitations. I have quite a few synths, and it is easy to get lost for hours in a knob tweaking fit trying to find the perfect sound. With the Volcas, you can tweak but just enough to have to live with what you create. I often think of how productive I was with my old cassette four track. You can walk away knowing the cassette is never gonna sound 100 percent, the machine is too limited. Because of that, the track is finished, and onto the next idea! I find the same level of satisfaction creating with the Korg Volcas. Also I’ve just been working on building a little portable Jambox out of a sliding DJ computer case, and wanted to see how easy it would be to use. So I just made a little melody, turned the camera on and had fun. The Korg monologue is run through the EHX deluxe memory man, which sounds great through an analog delay. You can get some big washy tones. Volca Sample is run through the Mini Kaoss Pad, I didn’t use the Kaoss Pad for much other than a few delay throws here and there. Volca Bass is being controlled by the Keystep, this way I can change the bass note of the little sequence I wrote. The Volca Keys is just straight up. I ran all instruments through a little Midiman Multi Mix 6, a perfect little Volca mixer found on eBay for about 30 bucks. The audio was recorded into the Zoom U44 interface, which I feel is basically the perfect iOS audio interface. Hope you enjoy! also check out our youtube page for more jams.